Californians for Energy Choice, a diverse coalition opposing an effort by the state's investor-owned utilities to gut Community Choice energy, decried passage of AB 2145 by the California Assembly on May 28. Labeling the bill the "Utility Monopoly Power Grab of 2014," the coalition noted that if passed by the California Senate and signed into law, AB 2145 would dangerously undermine California’s efforts to reduce greenhouse gas emissions and to create thousands of local clean energy jobs. In the past few weeks, over one hundred fifty local governments, government agencies, businesses and business associations, public officials, and grassroots community and environmental organizations have registered strong opposition to AB 2145. 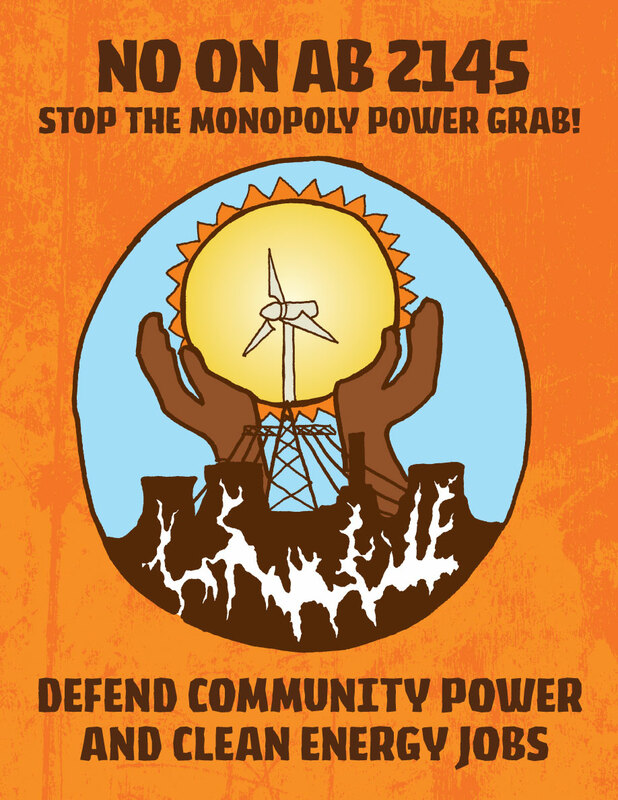 The Local Clean Energy Alliance has taken a prominent role in organizing this opposition. Authored by Steven Bradford, a former corporate utility executive, AB 2145 would halt the continued establishment of not-for-profit community-based energy programs under California’s Community Choice law (AB 117), enacted in 2002. Over a dozen such programs are in the works, including one in Alameda County, poised to compete with the big utilities by offering greener and lower priced electricity to customers. Two counties, Marin and Sonoma, are already doing so. Current Community Choice law enables customers in a city or county to band together at the launch of their program in order to gain the joint buying power needed to offer energy prices that can compete with the big utilities. Bradford’s bill would prohibit such grouped customer start-ups, making new Community Choice programs impossible to establish in California. AB 2145 will be heard in the California Senate's Energy Committee, where Community Choice advocates throughout the state are trying to stop its forward progress. To get involved, call Colin Miller, Coordinator of the Clean Energy & Jobs Oakland Campaign.